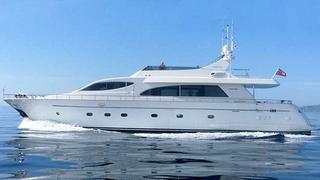 Vassilis Fotilas at Fraser Yachts sends news that he's signed the 25.26m motor yacht Amalthia for sale. Built by Falcon Yachts in 2001, she sleeps eight guests in four staterooms and twin 1520hp MTU engines give her a cruising speed of 21 knots. Lying in San Remo, Amalthia is asking €950,000, VAT paid.